Looking for great ways to celebrate Father's Day in Maine? We’ve got you covered. It’s important to make dad feel special, so here are our top choices for a day he won’t forget. While some dads would like nothing better than spending the entirety of Father’s Day in Maine parked in front of the grill sporting their new #1 dad apron, some dads might appreciate the day off from cooking. So why not treat pops to a great meal with his family? If you need some suggestions for a new place to try, we’ve got you covered. A day out on the gorgeous Maine water is one of the best ways to celebrate Father’s Day in Maine. Imagine it: you, your dad, the salty spray of the Atlantic, and heaps of new memories. Kennebunkport is a great jumping off point for a day of family sailing, as is Rockland and Belfast. 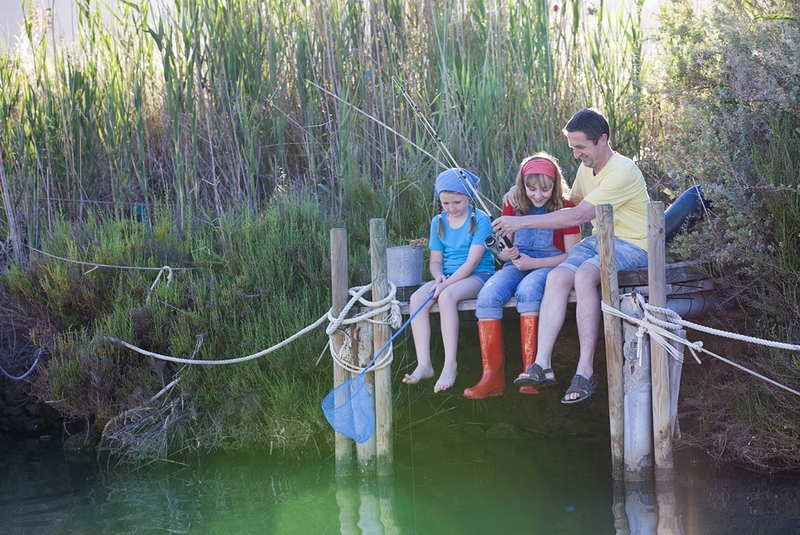 If your dad is more interested in what’s swimming in the water than sailing on it, why not treat him to an afternoon of fishing out on the lake? Be sure to follow his lead about how the day will unfold: whether it’s sitting in silence and enjoying the nature, or hearing tall tales from his youth. Southern Maine is home to some of the best scenic walking trails in New England! If dad is an avid outdoorsmen, why not organize a hike to enjoy the amazing views of the ocean on The Marginal Way near Ogunquit, or to the rugged landscape surrounding Mount Agamenticus (or Mount A, as it’s known to locals). Depending on your dad, this could be a night in playing Trivial Pursuit, or an evening at the batting cages or bowling alley. Although it’s his day, be sure to bring your “A” game and give him a run for his money! Another option is to visit an escape room. Currently all the rage, escape rooms are 60 minute puzzles for small groups that encourage communication and teamwork – perfect for Father’s Day! Looking to make a house your home this Father’s Day? We can’t wait to work with you! Contact us here.